All are tastefully furnished and fitted out.Located just 700m from Hoi An Ancient Town, Belle Maison Hadana Hoi An Resort and Spa, managed by H&K Hospitality, encapsulates the uniqueness of Hoi An’s heritage and culture to create an enchanting and serene charm, being the home of elegant lifestyle and utmost indulgence for all our valued guests. Located just 700m from Hoi An Ancient Town, Belle Maison Hadana Hoi An Resort and Spa, managed by H&K Hospitality, encapsulates the uniqueness of Hoi An’s heritage and culture to create an enchanting and serene charm, being the home of elegant lifestyle and utmost indulgence for all our valued guests. Belle Maison Hadana Hoi An Resort and Spa boasts 95 rooms and suites, all are tastefully furnished and fitted out, decorated using a warmth of neutral colors and unique textures. Each of our rooms features a private balcony where you can immerse yourself in the amazing view of the city, our pool garden or the unspoiled paddy field. Senior Deluxe room offers a balcony with pool view, seating area and personal safe. A cable TV, electric kettle and minibar are provided. Private bathroom features a bath or shower, free toiletries and hairdryer. Deluxe room has a balcony with Hoi An city view, seating area with cable TV. 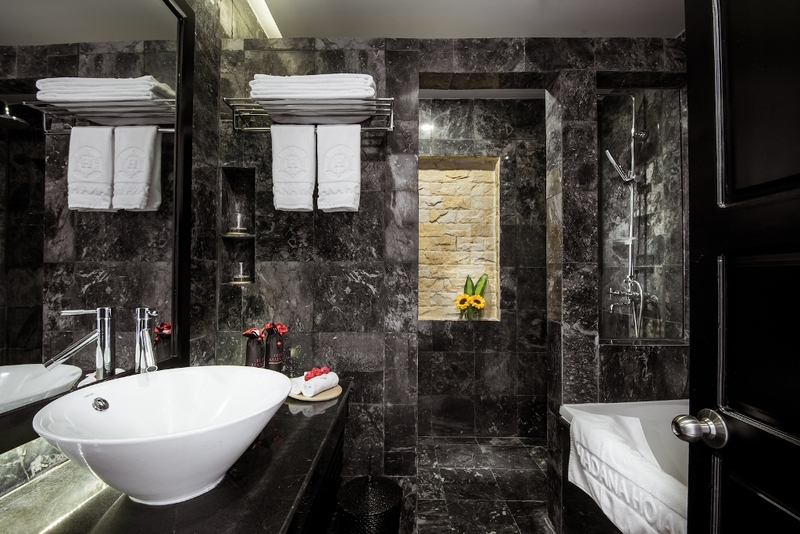 A private bathroom features a bath or shower, free toiletries and slippers. Offering views of the rice field, this Executive room has a seating area with desk, fireplace and safety deposit box. A minibar, cable TV and electric kettle are featured. An attached bathroom comes equipped with a bath or shower, free toiletries and slippers. Luxuriously appointed and thoughtfully serviced Suites offer views over swimming pool and Hoi An Ancient Town. The Suite consists of an elegant bedroom with king bed, spacious living room and a comfortable bathroom. Featuring Rice Restaurant and 3 bars: Café Terrace and Lobby Lounge, Pool Bar and Hadana Bar, Belle Maison Hanada Hoi An Resort and Spa offers the latest contemporary and stylish dining and entertaining where you can enjoy a unique culinary experience as well as a refreshing oasis during the day with a selection of light bites and refreshing drinks. Located on the ground floor of Belle Maison Hadana Hoi An Resort & Spa, Rice Restaurant is a perfect place for your memorable dining experience. Decked out in modern design with a tiled floor, wooden furnishings and cushion dining chair, this spacious restaurant is the ideal place to find tempting choices of Vietnamese, Asian and Western cuisine, especially a wealth of stunning Hoi An specialties. Whether you’re a competent cook or simply want a basic understanding of Hoi An specials and cooking methods, you can join cooking classes offered by Rice Restaurant as a great way to meet new people, learn new skills from our local chefs. Belle Maison Hadana Hoi An Resort & Spa provides a wide range of services for both business and leisure guests, as well as fitness and relaxation facilities. From our beautiful outdoor pool to the attentive staff, we have everything to make our guests stay in Hoi An relaxing and enjoyable. With 6 rooms that are aesthetically designed, Maison Spa is ideal for travelers and those who seek an escape from the hustle and busy city life. Guests can indulge themselves in our steam-bath, sauna and Jacuzzi and immerse into the paradise of relaxation of true spa therapy. Gentle care by our professional therapists and a tranquilizing atmosphere of the spa will further enhance your sense of wellbeing. A dedicated area for the young guests, our Kid’s Club provides various games and activities that evoke their pro-activeness and creativity. Follow the sun and save on your escape. Take all the time to experience the city when you stay at Belle Maison Hadana Hoi An Resort and Spa – the longer you stay, the more you save. Belle Maison Hadana Hoi An Resort and Spa is ideally placed to experience all the resort has to offer. This place is ideal for those who seek for enjoyable days and lively nights in a friendly and elegant resort.